Oh it feels so good to work in the studio again! I've spent so much of my free time working on the house, I forgot how much I love to just in my studio at night and work away. 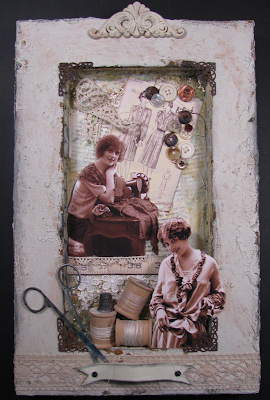 Here is another shadowbox for the studio. I haven't put the title on it yet, but I will be calling it Vive St. Anne. I believe St Anne was the patron Saint of seamstresses in France. Have a happy and creative Tuesday. Karen~ That shadow box is beautiful. I used to sew all the time and I would have loved that hanging on the wall in my sewing room. You out did yourself girl. Gorgeous!!! Beautiful, Karen! Love all your creations. Oh Karen I love this one!!!! You put so much thought & so many different things in this. SO interesting. I need to get the Trade Days behind me & get back in my studio. I miss it too. Have a great week. You wrote: "I've spent so much of my free time working on the house, I forgot how much I love to just in my studio at night and work away." Me too! I just started drawing again yesterday, after spending the summer working on so many house-related projects. I am enjoying 'following' along with your blog, Karen! And I am happy for you, knowing that special place we escape to when we have time to create. I am so envious of you amazing studio and your beautiful work. Keep it up!!! Karen, I love your work. I'd love to learn how to do that. Any seamstress would love this piece and nay no seamstress too!! I just watched a wonderful doc. on the garment district on NY. That's a beautiful shadow box, Karen. You are a master of small details! Your shadowbox is so pretty! Very creative....I am loving your kitchen too! Hope you have a great day! This is GORGEOUS girl! Love the spools and scissors! I was admiring your Halloween cards too. They're spook'tacular! So Sweet. Keep up the good work. I just love it Karen! Beautiful! Hi Karen; What a beautiful shadow box. all the vintage things look so great... you do amazing work.. I love it - it's beautiful, Karen! WOW! Adorable! So charming that it just made me ~SMILE~ & light up like a Christmas tree. Your seamstress shadow box is breathtaking! Just BEAUTIFUL! I believe that St. Anne would be delighted & honored!! I am spending quite a bit of time L@@KING at each intriguing to scared detail. I ADORE the 3-D effects. A true Masterpiece! My Grandmother was a seamstress who designed plus could create anything for my Mom just by looking at Vogue or any other fashion magazine. I never got to meet her so finding her old sewing supplies, buttons, spools of thread & Sunbonnet Sue Blocks was so fascinating to me as a little girl. Just found your inspiring site today! You are so talented! THANK YOU for sharing such happiness along with your divine talent! Happy Halloween from Tucson AZ!